Maison de Bonneterie opened its first branch in The Hague at the end of the nineteenth century, with a second in Amsterdam following a few years later. As the country’s first “shopping palace” and holder of a royal warrant, Maison de Bonneterie long stood head and shoulders above other Dutch fashion-led department stores with its exclusive image and clientele. When the business closed in 2014, new tenants had to be found for its two magnificent and historic buildings for the first time in 125 years. Maison de Bonneterie was a relatively small Dutch fashion retailer with a great history. After 125 years at the pinnacle of the nation’s retail landscape, the family-owned business closed its doors for the last time in 2014. In order to retain their prestigious properties as a long-term investment, the heirs of the original founders went in search of a suitable new tenant for both buildings. H&M was interested, but had strict technical requirements for the stores before it would take them on. That meant that the owners had to oversee thorough renovations, to a deadline, whilst at the same time preserving the original character of the listed buildings and important features like their stained-glass dome skylights. Conducting two simultaneous renovation projects in two different cities, both to a tight timetable and with the genuine risk that the necessary permits could not be obtained in time, represented a huge challenge. A multidisciplinary project team from CBRE advised the owners throughout the entire process, from the initial offer to let to handover after completion of the renovations. The let itself was subject to a number of basic conditions: the owners wanted a long-term tenant for both buildings, with retention of their original character and features. Coinciding with technical surveys of the two buildings, negotiations were initiated with potential tenants. These eventually resulted in a declaration of intent between Maison de Bonneterie and H&M. The principal condition set by H&M was that it had to have the keys to the premises no later than the end of July 2015, to give it enough time to fit out its new stores before the start of the peak retail season. At an early stage, the project was split into two parts. One included all work requiring permits, the other those activities not covered by planning or environmental regulations. From the design phase onwards, we worked with a firm of architects specialising in listed retail buildings and developed proactive relationships with the relevant heritage agencies. To keep to the timetable, every effort was made to secure permits within the standard period of 14 weeks rather than the 26 weeks usually required in the case of listed buildings. During the design phase and permit process, demolition and asbestos removal works were prepared and carried out under a Notice of Demolition. Installation of new escalators and additional customer staircases. Renovation of the existing lifts and installation of additional ones. Restoration of original features like column decorations and the buildings’ frontages. Safety upgrades to the original atria and balustrades, including the addition of protective glass balustrades. Upgrades to the sprinkler systems to extend their coverage and to the electrical systems to increase their capacity. Structural modifications for the new tenant, to facilitate its occupancy of the premises. 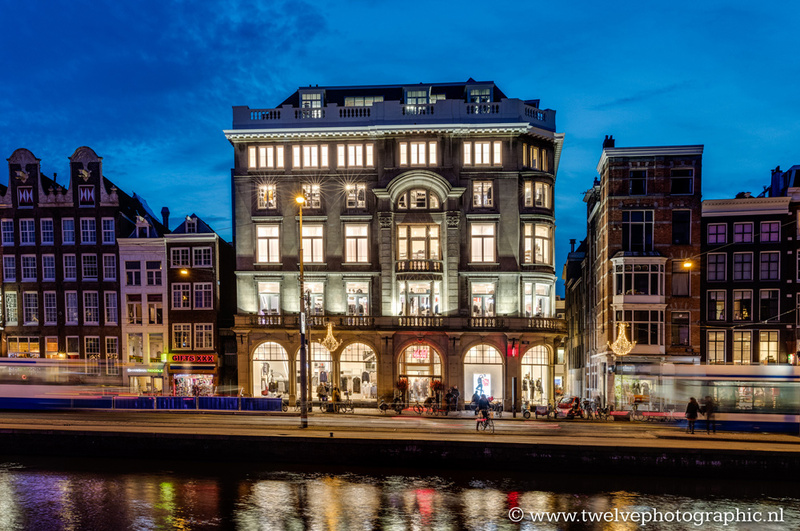 H&M held the gala opening of its new flagship store in The Hague in November 2015, with Amsterdam following in December. Despite some unexpected problems with asbestos removal and the need to carry out overdue maintenance, the two extensive renovations were completed to specification and within budget. By involving the heritage authorities in the project from an early stage, we were even able to secure an additional heritage grant for the renovation and maintenance works.